Hawaii’s state government arts agency. The mission of the State Foundation on Culture and the Arts (SFCA) is to promote, perpetuate, preserve and encourage culture and the arts as central to the quality of life of the people of Hawai‘i. 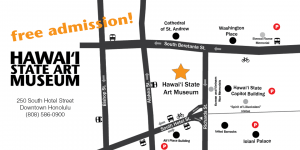 SFCA funding is provided by the State of Hawai‘i and the National Endowment for the Arts. The SFCA is administratively attached to the Department of Accounting and General Services (Hawai‘i Revised Statutes Chapter 9). View some of Hawaii’s best contemporary art. Museum admission and activities are always free! Monday – Saturday 10:00 a.m. – 4:00 p.m.
Search the Art in Public Places Collection by artist name, artwork title, medium, and more. Art for state government buildings (current sites): Elizabeth Baxter, Curator. Telephone (808) 586-9951 or email elizabeth.m.baxter@hawaii.gov. Art for state government buildings (new sites): Karen Ewald, Director, Art in Public Places Program. Telephone (808) 586-9950 or email karen.a.ewald@hawaii.gov. Invite the SFCA to send an Acquisition Award Selection Committee (AASC) to an exhibit: Relocatable Works of Art. Elizabeth Baxter, Curator. Telephone (808) 586-9951 or email elizabeth.m.baxter@hawaii.gov. Supporting, fostering, and celebrating the artistic expressions of Hawaii’s diverse cultures and communities. Enhancing public engagement in culture and the arts. Strengthening arts education for all learners. The State Foundation on Culture and the Arts retains all rights to data, images, text, and any other information contained on this website. The artwork herein are copyrighted by either the artists themselves or by the State Foundation on Culture and the Arts. More details can be found here: Website Disclaimer.